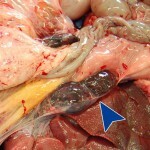 In two pig carcases, males, of hybrid breed of about 6 months of age, the presence of whitish nodular lesions adhered to the peritoneal serosa can be seen in the abdominal cavity. The lymph nodes are hyperplastic and it is unknown if the thoracic cavity was affected. Witish nodules with a smooth surface in the serosa of the liver and the diaphragm. 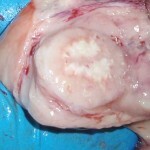 The same lesion coud be observed on the spleen capsule and on the mesenterium. 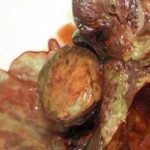 Detail of the lesion on the spleen, once the sample was fixed and sectioned. 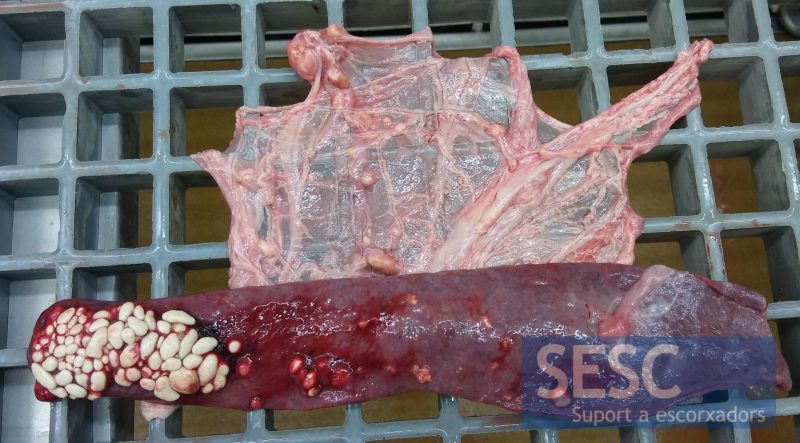 The histopathological study demonstrated a granulomatous peritonitis, but it was not possible to establish which agent had caused it. The presence of gram-positive bacteria (staining of gram) and resistant alcohol acid bacilli (Ziehl Neelsen staining for Micobacteria) was ruled out, no fungal compatible structures (Groccott staining) nor parasites were observed. And a neoplasic process was also ruled out. If you have seen a similar lesion you can send us your comments at the end of the post. Not quite right.... The lesion is inflammatory but we could not determine the cause. Neoplasia was ruled out. You are well-trained! The lesion is inflammatory but we could not determine the cause. Neoplasia was ruled out. 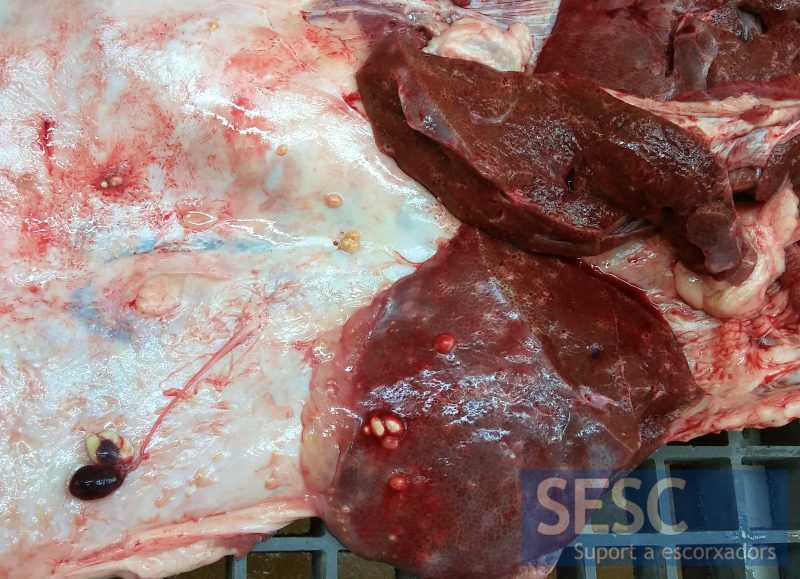 This entry was posted by SESC on 19/10/2018 at , and is filed under Abdominal cavity (porcine), Liver, Porcine. Follow any responses to this post through RSS 2.0.You can leave a response or trackback from your own site.